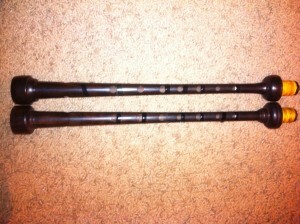 I was sittin’ on the john at work perusing eBay on my iPhone when I ran across a buy it now for an african blackwood Atherton chanter. So I bought it, duh! 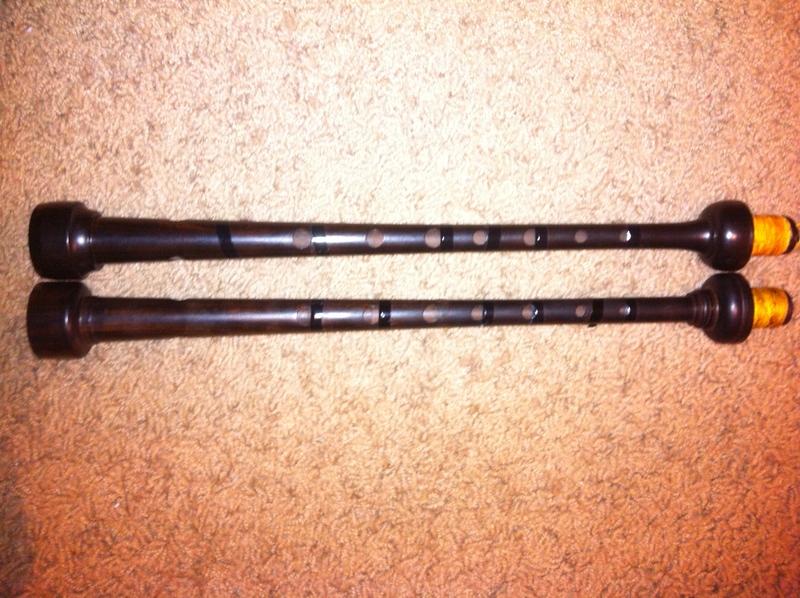 This chanter came from Doug MacRae, at least, going by the eBay name. At the price point, I figured it wasn’t pristine and having a look at it, it has been undercut on just about every hole, C and up. Who did that, I have no idea. But, who cares? It plays GREAT! And it was easy to tune; of course the undercut modifications helped. Otherwise, I can see the top hand being rather flat. Couple no undercutting with the relatively narrow reed seat (compared to a Kyo, if that tells you something) and I can imagine it could be hard to get a reed in far enough to bring the top hand up sharp enough, so the undercutting was probably a necessity more than anything. None of the holes have been enlarged though. It came in right at 480 Hz for me. Same pitch as my band blackwood Colin Kyo chanter. Colin Kyo’s actually tune a wee bit higher (well, some of them), so I’ve got tape on my CK low A and the reed pulled out a little to get it down to 480 Hz. Below you’ll find a picture of the Atherton right next to said Colin Kyo. You’ll notice the hole spacing is effectively identical. Atherton on top, CK on bottom. Onto the recording, I’ve got my D. MacPherson blackwood bagpipes with boxwood ferrules and ringcaps with Kinnaird tenor drone reeds and a Rocket bass drone reed accompanied by an Atherton chanter with a Husk reed. Tunes are Hector the Hero (James Scott Skinner) and the Rock (Jimmy Mitchell). I finally met Jimmy last weekend and got to chat a bit. Jimmy used to play with the Hamilton Pipe Band in Houston, TX and this series of tunes is one of the tracks on their album, First and Ten. Jimmy’s nickname apparently was “the Rock” and this was the first tune he wrote. I also got to hear the St. Thomas Alumni Pipe Band last weekend which has a lot of players from the old Hamilton band, so this set is for Jimmy, Hamilton, and St. Thomas Alumni! When I played with the Lyon College pipe band under Willie Muirhead, we also opened our second place medley at the World’s in 2001 in grade 3B with the Rock.